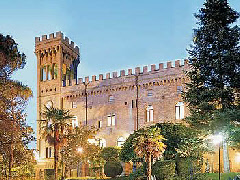 Just a few miles to the south of the city, Torre dei Calzolari Palace is an imposing former fortress of which parts are reputed to date from the 12th century. Indeed, the building is said to have once been the property of Frederick Barbarossa, King of Germany (and later King of Italy) who made a number of military campaigns into the north of the country during the mid 1100’s. Guest rooms are located in the more recent villa which adjoins the castle, while the hotel also boasts an outdoor swimming pool, a restaurant which specialises in Umbrian cuisine, a bar, and even a consecrated chapel.